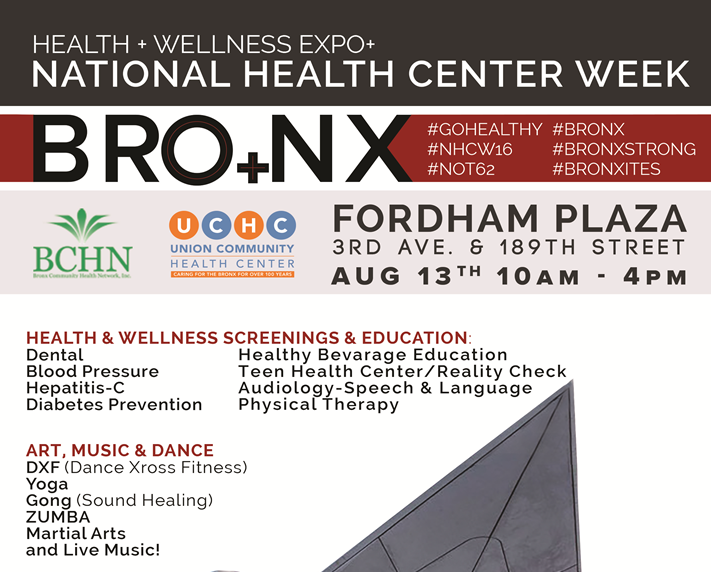 Bronx Community Health Network (BCHN) and Union Community Health Center (UCHC) partnered with O+ Festival, Montefiore Health System, Urban Justice Center, Fordham Road Business Improvement District, NYC Department of Transportation and several CBOs on the Bronx Health & Wellness ExpO+ at Fordham Plaza on August 13. The event capped off a week of activities that celebrated National Health Center Week, including BCHN's annual recognition dinner. The recap below was submitted by BCHN and UCHC to the #NHCW16 video contest.